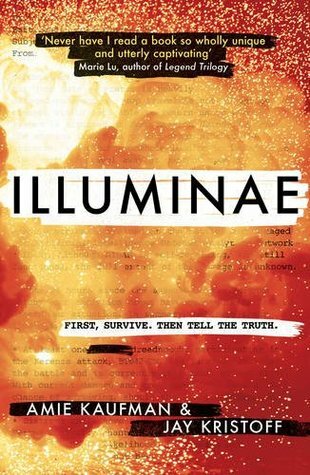 The Review: Illuminae is a gripping and fast paced YA sci-fi story written in a truly unique and fascinating way. You can dive into Kady and Ezra’s story following the aftermath of their planet being invaded through hacked documents including interviews, emails, military documents, medical reports, illustrations and many more interesting ways. When I started Illuminae I didn’t know what to expect and I must admit for the first 100 pages I didn’t know if the was the type of novel that could keep me interested in the story. But it did and I honestly flew through the pages as quickly as possible to find out how it ends. Now you’d think a 599 page book would take a while to get through but it doesn’t. It’s a really quick read with some many unique ways of telling the story that I was blown away by the details in this book. I have no idea how long it must have taken to create a book like this but as a reader, it’s definitely a book I won’t be forgetting for a long time and it most definitely stands out from the crowd of other YA sci-fi stories out there. Kady and Ezra’s story is what drew me into the story to start with and without their story I know I definitely would have lost interested. But these two characters were fantastic! Most of their communications are through emails during the book story and I really enjoyed it. If anything it intensifies their relationship and their banters and as a reader I didn’t feel like I missed anything by that. I actually really enjoyed how their story was told. The plot of the story was full of suspense and a great page turner. I for one can’t wait to see what happens next in the series – even if it is a different set of characters – I know some of you don’t like that - but I can’t wait. I do hope Kady and Ezra pop up at some point though. Thank you to Rock the Boat for giving me the opportunity to review this book in exchange for an honest review. #Hashtag Reads + Chance to Win Your Height in Books! I'm here today with some exciting information direct from Hashtag Reads! If you're not aware of what Hashtag Reads is, well let me fill you in. 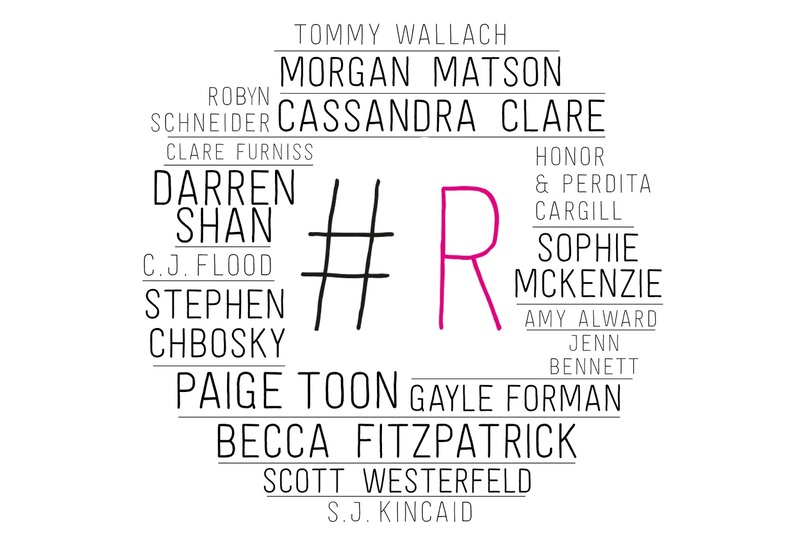 Hashtag Reads is home to some of the best-loved YA authors including Cassandra Clare, Gayle Forman, Paige Toon, Morgan Matson and Darren Shan and many many more which you can see from the picture to your right. It’s a great place for readers to find out about the latest YA reads, hear more from their favourite authors, read exclusive material and enter the hottest competitions. Yes, you heard that right. Not only do you get exclusive material but exciting competitions as I know how much you all love that! 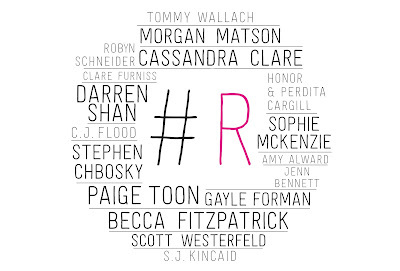 So I bet you're wondering how you sign up for Hashtag Reads? Well, all you need to do is sign up for their newsletter which you can do below where it says SIGN UP NOW. Once you've entered your email and you're all signed up, guess what? Once you sign up you've been entered the draw to WIN YOUR HEIGHT IN BOOKS! But not only that, it's a chance to discover more information about your favourite authors and so much more! What have you got to lose? Nothing. So sign up and show your support. I know I am. Summer lives under a terrible shadow. It drains her, manipulates her and threatens to steal her future. A high-stakes mission offers a temporary escape. She must use her mind-shadowing abilities to hunt down her target and find the truth. Hal Robinson is a soldier. He does not get distracted. He wins. But what Hal wants begins to shift once he meets Summer. They must learn to trust each other if they are going to protect the Savant community. But will their secrets allow them to find a happy ending of their own? 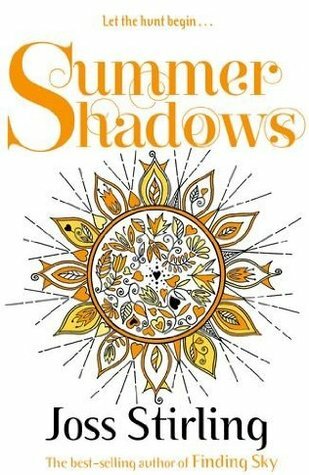 The Review: Summer Shadows is about Summer finding her Soulfinder and also about Victor Benedict finally finding his amongst the Savant community. Summer’s life at home is not ideal, she has to hide secrets about her family to everyone she knows and it’s physically and emotionally draining, especially when her mother is literally draining her emotions – she’s the savant equitant of a Vampire and she’s dangerous to anyone who meets her. Because of this, Summer’s future of finding a Soulfinder is in jeopardy. But when she’s asked by the Benedict’s to help Victor find his Soulfinder, Summer jumps at the chance to help him and also they need her on board because her gift of telepathy means she’s one of the strongest people to help. While helping the Benedict’s in Afghanistan it’s there she meets Hal Robinson but will she be able to count on Hal like she needs him to? I’ve been a huge fan of the Benedict series by Joss Stirling ever since the first book as released way back in 2010. I have to say now I’ve came to the end of their stories and the series, it’s a bit of a bittersweet moment. I’m happy but I’m also sad there will be no new books! But honestly, it’s been a great journey and I’ve thoroughly enjoyed following these lovable characters, discovering the savant community and reading about everyone’s journeys to find their loved ones – or in Savant terms their Soulfinder – and that also includes the newer savants that were added along the way. As I’ve followed this series I’ve come to love each and every character and their journey’s and while I did love both Summer and Hal, I didn’t love their story as much as the others. I think it came down to the setting in Afghanistan and everything came with it, the war talk etc. But despite that I did really enjoy reading how Summer and Hal came together and finding out how when the two of them work together, they can take on the most difficult of tasks and that for inside and outside the Savant community. I most enjoyed seeing where all the other characters were at and see what came next for them. I would have loved an epilogue – a really long one maybe set 15 years into the future. That would have been the icing on the cake to finish this series off. I’m hoping Joss will decide to write something like this in the future, hopefully! In all, the Benedict series is definitely one to read if you’re a fan of YA paranormal romance and if you’re not, why not start here and see what you’re missing. Thank you to OUP Publishing for giving me the opportunity to review this book in exchange for an honest review. Quinn Sullivan lost the love of her life when her boyfriend, Trent, died in an accident their junior year. In an attempt to get closure, she reached out to the recipients of his donated organs. Though some answered her letters, the one Quinn feels matters most--the person who received Trent's heart--has been silent. Nineteen-year-old Colton Thomas has spent the last several years in and out of hospitals waiting for a heart transplant. Now that he's finally received a new heart, Colton is regaining strength, and he's walking away from his bedridden past with no intention of looking back. He doesn't want to know about the person who had to die so that he could live. He only wants to move forward. But Quinn can't let it go. Venturing outside the system to find Colton, Quinn takes a risk in hopes of finally laying her memories to rest. But what begins as an innocent conversation quickly becomes an attraction--and to make matters worse, Colton has no idea how they're connected. His zest for life pulls Quinn from her months of sorrow but leaves her torn between honesty and utter betrayal. Because no matter how hard she's falling for Colton, each beat of his heart reminds her of all she's lost. The Review: Things We Know by Heart is a beautifully written and moving story by YA author Jessi Kirby and it’s one that’s going to stay with me for a long time. When Quinn Sullivan’s boyfriend Trent dies, her world is turned upside down and she doesn’t know how to move on. So when his organs are used and go to people who are on the donor waiting list, Quinn decides to reach out to them through the reach out program and see if this helps her to move on. Four out of five people response but the person who receives Trent’s heart doesn’t. Quinn does the only thing she knows she’s not supposed to not do – she tracks the person down but it’s something she’s not prepared. Her and Colton Thomas’s first meeting doesn’t go to plan. After that, Quinn knows she’s breaking the rules but there’s something about Colton that she’s drawn to and Colton’s pretty determined to get to know her too. But can they have a relationship when there are so many secrets between them? I loved Things We Know by Heart. It’s such a short story – just 300 pages – which I flew through it within a day. Had it of not been for work I would have finished it much quicker. Even though it’s a short read, it didn’t stop the feels I got from this book. The emotions really packs a punch from the impact of this story. It’s such a heart-breaking read. It’s a story about loss and life but then hope and love. Jessi Kirby writes the story so beautifully that is well developed and you can see through each chapter how much research has gone into the story. The characters are written great. Quinn is a teenage girl that makes mistakes but also recognises when she’s made them. Her decision to find Colton might not have been the best one but once she meets him, she can’t forget him. And the same goes for Colton. They have an undeniable connection that as a reader, you can see immediately. It’s not an insta-love but a just a tiny spark that continues to grow throughout the story. I loved all of Quinn and Colton moments. I struggled with them. I cried with them. And I laughed with them. I came to love both of them very much and even Trent that we only see through Quinn’s memories. He was a lovable character too. Admittedly the plot of the story is a little predictable but it didn’t bother me at all. I was so wrapped up in the story that no matter what, I loved it. I loved everything about it and even though Quinn and Colton’s story is over, I can’t help wanting more. In all, Thing We Know by Heart is a beautiful story, full of angst, heart-break, grief, hope, and love and about moving on after losing a loved one and I'm proud to have this book sitting on my shelf - definitely one of my favourite contemporary reads to date! Thank you to Harper 360 for giving me the opportunity to review this book in exchange for an honest review. Author Interview with Jessi Kirby! 1) Could you tell us a little bit about Things We Know by Heart? 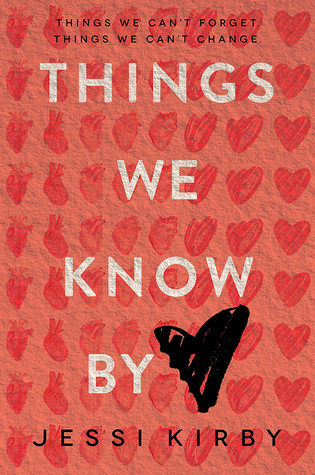 Things We Know By Heart is the story of a girl who loses her boyfriend in a tragic accident. When his parents make the decision to donate his organs, she reaches out to the recipients in an effort to deal with her grief. All of them respond but one--the one who she believes is most important, because he received her boyfriend’s heart. Quinn can’t seem to let this go, so she finds out who he is, which leads to an unintended meeting, where they have an undeniable connection. 2) Where did you get the idea behind the story? I first got the idea for the story when I read an article about the theory of cellular memory—the idea that our very cells carry the “memory” of who we are as people, so that in the case of transplants—especially heart transplants—there’s this idea that some essence of the donor could be present. There are all sorts of anecdotal stories about this, and that’s the original direction this story was going to take. But then I started researching the relationships between donor families and recipient families—how some want to meet each other, and others never do, and that’s what I found most interesting. I thought about how complicated it would be if one party really felt the need to meet, and the other absolutely did not want to do that, and that’s where Quinn and Colton came from. 3) How long did it take to write? This took roughly a year to write. 4) What was the most challenging thing about writing this book? The thing I found most challenging about writing this book was balancing out Quinn’s grief over her first love with the fact that she was healing from that grief and finding a new love. 5) Do you have a favourite non-spoiler quote from the book? 6) Can you describe Quinn and Colton in three words? Next up I have a novel called THE SECRET HISTORY OF US, which will be released in Summer 2017, and is about a girl who has a near-drowning experience. When she wakes from a coma, she has lost the memories of her most recent years—those that include high school, graduating, and even her boyfriend. This one is a story of trying to find out who you are, while uncovering secrets about your past. 1) What would we find in your refrigerator right now? Ha! This is a fun question, and no one has ever asked me this. I try to eat pretty clean, so lots of fruits and veggies, but it’s also summertime, so there’s almost always a bottle of Sauvignon Blanc there for when friends stop by. If you looked in the cabinet, you’d find my favorite treat to have with that wine—potato chips. 2)What are some of the most recent books you’ve bought? I just picked up HIGHLY ILLOGICAL BEHAVIOR by Corey Whaley, and THE UNEXPECTED EVERYTHING by Morgan Matson, both of which I can’t wait to read! AUTHOR BIO: Jessi Kirby is a former English teacher and librarian. She lives in Orange County, CA with her husband and two kids, where she writes stories and runs the beach every day. Well, almost every day. You can contact Jessi at jessi@jessikirby.com. For fans of THE HUNGER GAMES and DIVERGENT - the thrilling new fantasy novel from Victoria Aveyard, bestselling author of RED QUEEN. The Review: After falling in love with Victoria Aveyard’s debut novel Red Queen it’s safe to the sequel Glass Sword was high on my TBR to read and I’m happy to say that it really is a worthy sequel. Glass Sword continues where Red Queen left off with Mare Barrow’s, the lightening girl running for her life from the person she came to trust Maven, the Silver King. The only good spot in these events is Cal, the dethroned Silver King, is with her so there in this mess together being hunted by friend, brother and crown. After stumbling across danger at every corner Mare and Cal are taken in by the Scarlet Guard and so their journey begins in trying to rescue their friends and people that were captured but also by trying to take down the Silver King. I just can’t get enough of this series. As I said before Red Queen really impressed me last year and I always worry with the sequels that they won’t live up to my expectations but Victoria Aveyard really delivered. I feel the plot of the story grew more intense and thickens at every turn leaving you dying to know what happens next. It’s a story that delivers action, danger and even romance that keeps you interested all the way through. And it the characters are written in such a way that makes you feel so connected to them that you feel every emotion that their experiencing. 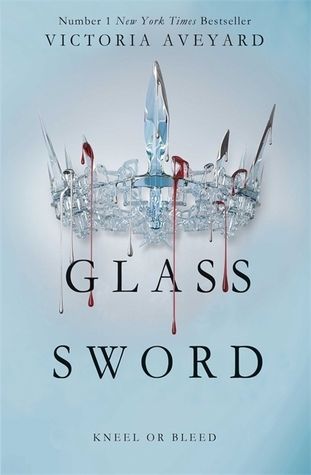 Glass Sword really puts our heroine through the ringer and I had so much sympathy for her but at the same time, I’m one of her biggest fans rooting for her and hoping she pushes through. She isn’t perfect and she makes mistakes and that’s very clear throughout this chapter of her story. We have to remember she is only a seventeen-year-old girl who learns through her mistakes, and so she will continue to make them. This definitely makes her stronger though. It’s not just Mare who makes this series so good though, it’s also the secondary characters like Kilorn, Captain Farley and Cal. Cal is definitely a favourite of mine – there’s really no need for me to explain why is there? But I love his presence in the book! And the new addition of characters was an added bonus too! In all, if you haven’t read this series then I’d highly recommend you do. I for one cannot wait for the release of the third installment, Kings Cage! Thank you to Orion Publishing for giving me the opportunity to review this book in exchange for an honest review.